Myanmar is home to many of the region’s most beautiful beaches, some of which remain hidden gems. Most are unspoiled and undiscovered by the masses. And Myanmar’s beaches face west, offering spectacular sunsets. Beach season is coming; October to March are the perfect months in which to relax on the beach because the weather is pleasingly cool and comfortable. Some of Myanmar’s major holidays, like the Thadinkyunt Festival (Lighting Festival) are on the way, and hotels are offering promotions ahead of the high travel season. To help you get ready for the beach season, The Irrawaddy has compiled this list of the most popular beaches in Myanmar and some of the hotels that are offering promotion plans and packages. 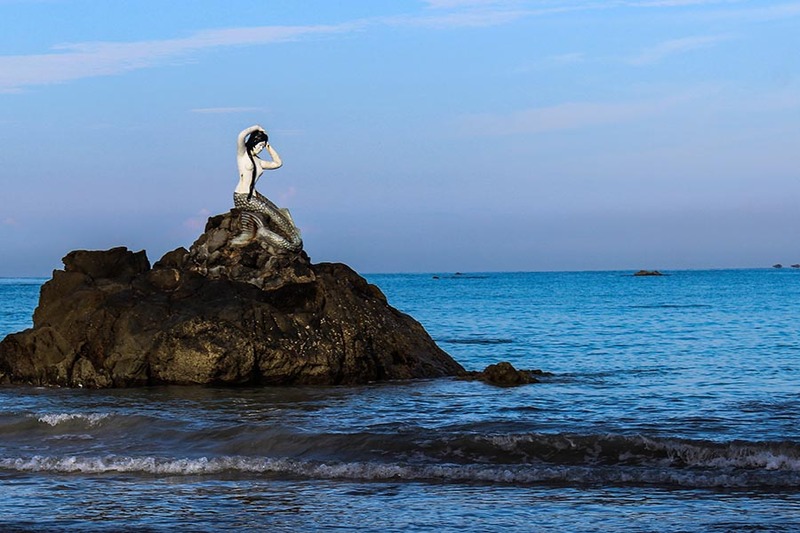 Ngapali Beach is one of the most well-known and beautiful beaches in Myanmar. It is also one of the country’s most popular tourist attractions. The beach is located 7 km from Thandwe, in Rakhine State, and is famous for its pristine white sand, palm trees, crystal clear water and clean environment. As a popular tourist destination, the beach has plenty of activities to keep you busy, from water sports such as snorkeling, scuba diving and kayaking, to cycling on the beach. The beach offers the most stunning sunset view. It’s a bit far from Yangon. You’ll need to ride 16 hours by bus to get there, so most people fly. There are several daily flights from Yangon to Thandwe. The flight takes 45 minutes. You can ask your hotel to arrange a pick-up. A couple walk along the sand and relax at Ngapali Beach. For accommodation, there are a few budget hotels as well as high-end hotels, resorts and villas, so there is plenty of choice. Ngapali Beach offers a luxury stay with breathtaking views. And yes, there are a lot of fresh seafood restaurants there. Pleasant View Resort is one of the most beautiful resorts in Ngapali Beach. They offer spectacular views of Ngapali. The resort has four different room types and the first 10 customers who book a room for this coming holiday will get one free dinner for two. The room prices range from 145,000 to 230,000 kyats. 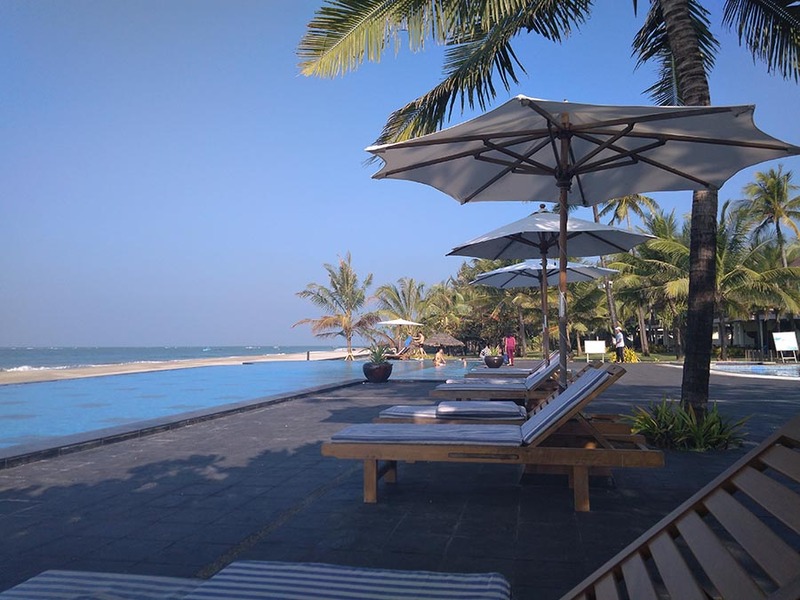 Thandwe Beach Hotel is a 3-star hotel near Zeebyugon Village and Ngapali Junction. The hotel has bungalow sea-view rooms and garden views. They offer special October promotions ranging from 80,000 to 180,000 kyats for four different rooms types. This promotion is for only locals, however. 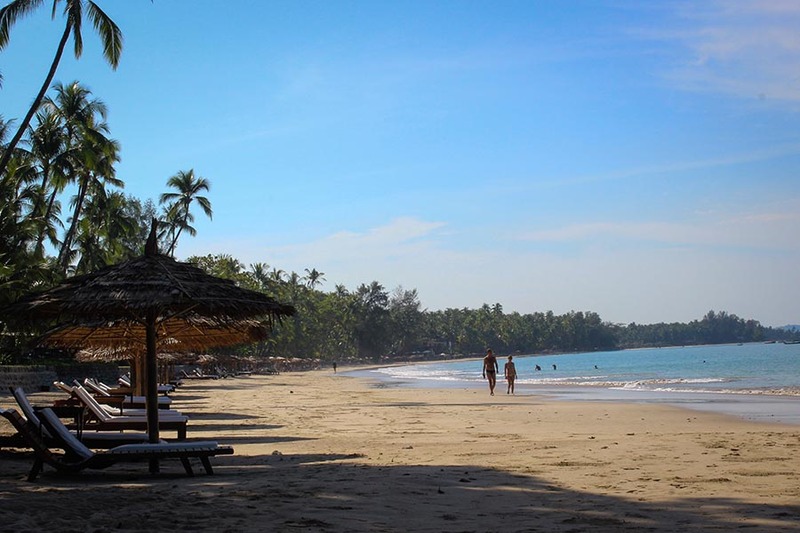 Ngwe Saung Beach is located on the Myanmar shore of the Bay of Bengal in Ayeyarwaddy Region. It is also one of the most famous beaches in Myanmar. It is popular with both foreigners and local people for its silvery, sandy beach, cleanliness and peaceful environment. It’s also a good place to swim and take long walks along the beautiful beach. The beach is always packed during the holidays and beach season because it’s only 260 km from Yangon. It takes about five hours to drive there, depending on what transportation you use. Like Ngapali Beach, this beach also has a variety of water sports on offer. Some hotels are far from the village, giving them the feel of a private beach getaway. There are plenty of fresh seafood restaurants and vendors, and you can order home-cooked seafood from villagers as well. People frolic in the pool at a hotel on Ngwe Saung Beach. Riding a beach motorbike is a popular activity, and you can also ride a horse. The popular beach has a wide range of accommodation choices including budget stays, tents and high-end resorts and villas. The sunset is breathtaking. It’s a perfect place for people who don’t have much time to travel and need a nice weekend getaway spot. There are plenty of bus lines traveling to Ngwe Saung every day. Eskala Hotel and Resort is one of the prettiest accommodation spots on Ngwe Saung. Their pool has stunning views of the beach and the sunset. This beach season, they have a special discount on bookings—15 percent off all room types from Oct. 1-20. This one is near the village and very convenient for lunch or dinner spots. It is a mid-range hotel and has an infinity pool, but the beach is a bit crowded. They also offer 30 percent off for all room types from Oct. 1-19. Chaung Thar is very close to Yangon and Ngwe Saung. It’s only a four-hour drive from Yangon. The beach is not as pretty as Ngapali or Ngwe Saung, but it’s famous for its plentiful, cheap, fresh seafood. The sand isn’t white and is always packed with locals, especially on weekends and holidays. Accommodation prices are rather high considering the fact that the beach really isn’t that pretty. But if you search you’ll find some bargains. Azura is a popular place to stay in Chaung Tha. The beachfront hotel has a pool and garden. They have two types of promotion plans: a weekday package and a weekend package. The weekday package costs 46,000 kyats per person including round-trip bus ticket, breakfast, dinner and one night’s stay at the hotel. The weekend package is 49,000 kyats per person, and includes the same features as the weekday package. So, the beach season is on the way. Choose one of the beaches above and have a very relaxing “beachcation” on your holidays. Don’t forget to book a room before you go!